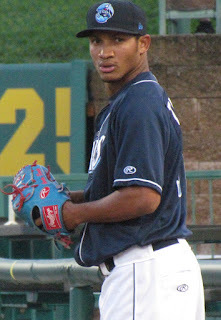 LAKEWOOD, NJ- Alberto Tirado struck out 10 batters over six scoreless frames on Thursday night as the BlueClaws downed Kannapolis by a score of 2-0 at FirstEnergy Park. The win, along with second place Hagerstown's loss, put the 'Claws ahead by four games with four left to play, placing Lakewood's magic number to clinch the second half South Atlantic League North division title at one. Righty Blake Quinn threw two innings and closer Sutter McLoughlin pitched a frame to wrap up the one-hit shutout for the home club. The effort by Tirado marks his second straight outing with double-digit strike outs. In his previous start against Greensboro, he struck out 11. "He did a great job using his fastball and then his slider when necessary and when he had some traffic in that one inning (the 2nd inning, in which the first two batters reached base on a hit by pitch and a walk), he really slowed the game down and showed some mental toughness and I'm just proud of the way he's developed," pitching coach Brian Sweeney said of Tirado's effort. Since converting to a starter after opening the season as a reliever, the 21-year-old Dominican has posted a 7-1 record with a 2.19 ERA and a .195 batting average against in 11 starts. "I work with my team and that's the key," Tirado stated, stressing the importance of helping the team reach the playoffs. "I want to go out there and throw five, six or seven innings to help my teammates." Tirado, who grew up admiring Pedro Martinez and his dominant efforts on the mound, hopes to model himself after the three-time Cy Young Award winner. Designated hitter Mark Laird paced the offense notching three safeties. The 23-year-old is batting .350 in 27 games since joining Lakewood. He has hit safely in 13 of his past 14 games. Lakewood is slated open a four-game series with Greensboro, to wrap up the regular season, on Friday night at 7:05 PM. Tickets are available at the box office or at BlueClaws.com. "When I started out the season here, I was a little sad because I wanted to start, but I went to Florida and I kept it going. I'd go with Clearwater for two or three innings, but then I came back here to start. (Now) I can go seven or six innings and I'm very happy right now with that." "Oh, definitely. You know, we want to see him succeed and put him in an environment, like every other pitcher, to succeed and you've got to earn that fifth inning and you've got to earn that sixth inning. And he's doing that. And it's not that we're putting a cap on him. When he's pitching well, we'll happily throw him out there with the way he's been filling the zone and with his explosive stuff." "I mean it's hard to not recognize that electric arm, but it's got to be controlled, it's got to be harnessed and he's done a lot of work, mentally and physically, to get where he needs to be. Physically, with his delivery, keeping it simple, getting a good load and repeat, it's really paid dividends for him. And really, the mental toughness that he's shown, from the beginning of the year till now, is night and day better. And really, like I said before, I'm proud of him and his accomplishments."